This article is published in conjunction with a screening of The Night of the Hunter at Museum of the Moving Image on Sunday, December 15, at 4:30 p.m., as part of the series See it Big! : Great Cinematographers. The series, and the article, are co-presented by Museum of the Moving Image and Reverse Shot. Stanley Cortez¡¯s cinematography is the glow of unbalance and neurosis, of fissures widening across psyches. A highlight reel of his oeuvre would play like a montage of classic American cinema¡¯s most vivid meltdowns: Think of Agnes Moorehead¡¯s Aunt Fanny as she cries in the bare living room of The Magnificent Ambersons, Joanne Woodward convulsing as her multiple personalities churn within her in The Three Faces of Eve, or Peter Breck¡¯s frenzy in the asylum ward reaching a literally electric pitch in Shock Corridor. Hysteria, whether repressed or fiercely eruptive, frequently lurks in Cortez¡¯s combustible spatial arrangements, so it¡¯s a shame that he never got to work with frenzy maestro Joseph Losey. While it¡¯s intriguing to imagine what Cortez would have brought to that American director¡¯s portraits of England, one wonders if that would been half as extraordinary as his collaboration with Charles Laughton in 1955¡¯s The Night of the Hunter, an English director¡¯s portrait of America. Laughton, a consummate stage and screen actor whose performances scarcely lacked a touch of the baroque, was interested in extending his directing abilities from theater to film, and saw in Davis Grubb¡¯s 1953 novel the ideal subject for that transition. Grubb reportedly would send Laughton sketches for the visualization of certain scenes, while legendary literary whirlwind James Agee¡ªfilm critic, screenwriter, award-winning novelist¡ªwas hired to write the adaptation and delivered a sprawling screenplay overflowing with camera directions of his own. Add to them contributions from such potent personalities as score composer Walter Schumann, set designer Alfred E. Spencer, and Cortez himself, not to mention iconoclastic leading man Robert Mitchum, and the project starts to suggest a crisscross of dueling auteurs. Yet The Night of the Hunter endures to this day as a singular fusion of artistic voices and elements, their equilibrium paradoxically resulting in one of the screen¡¯s most unforgettably jarring visions. ¡°Fear is only a dream,¡± or so goes the lullaby over the opening credits. Right from the opening images, with the faces of young boys and girls superimposed like shining stars on a night sky, the timbre is disconcertingly childlike. Helicopter shots further establish the celestial vantage point, descending to a farm in Depression-era West Virginia, where a woman¡¯s corpse is discovered by a batch of kids. An abrupt cut accompanied by blaring horns introduce Harry Powell (Mitchum) on the road in a stolen jalopy, clad in black from top to bottom and engaged in a casual, one-sided conversation with his maker. ¡°What¡¯s it going to be, Lord? Another widow?¡± The very personification of a ravenous fairy-tale wolf, Powell is so much the ¡°false prophet¡± the film¡¯s prologue warns children about that his malevolence appears to contaminate the mise en sc¨¨ne surrounding him. At a burlesque house, he sneeringly watches a striptease until the ithyphallic switchblade in his pocket bursts through the fabric¡ªCortez keeps a harsh spotlight around the dancer onstage while the other patrons in the audience are hooded by darkness, the first of the many instances of minimalistic sets transformed by unsettled lighting. The transition from the claustrophobic music hall to a vast flowery field further evokes a feeling of polar opposites kept safely apart, quickly undermined as crime and punishment intrude upon the pastoral tableau. Rushing home with bloodied hands and stolen loot, Ben Harper (Peter Graves) has just enough time to tell his young son, John (Billy Chapin), and tiny daughter, Pearl (Sally Jane Bruce), to conceal the money before policemen haul him away. Ben crosses paths with Powell while awaiting execution in jail, and soon the serial-killing preacher is setting his sights on the ten thousand dollars his cellmate has stashed back home. (In an evocative digression, the film momentarily leaves the main characters to follow a hangman from prison to his house, where the shabby figure of death is revealed to be a meek paterfamilias.) On the surface a rural idyll, the children¡¯s hometown gradually emerges as a beehive of busybodies, bereft drunks, slatterns and other lost souls. In this fragile veneer of order, devastation in disguise is an eternal threat. ¡°I just don¡¯t want a new husband,¡± declares Willa (Shelley Winters), John and Pearl¡¯s widowed mother. Cut to a locomotive barreling across the screen, its smoke and whistle as alarming as those of the train that once carried Uncle Charlie in Hitchcock¡¯s Shadow of a Doubt. As if determined to disprove the notion that actors-turned-directors have a tendency to focus on performances at the cost of visual expression, Laughton in The Night of the Hunter is above all a fiendish imagesmith. When Powell materializes at the children¡¯s home, he¡¯s a looming silhouette projected on a window curtain, a sinister figure invading their makeshift shadow play. Having charmed Willa into marriage only to shame her into religious fervor, he presides over the local revival meeting in a sequence that daringly echoes the earlier burlesque house scene: a spectacle of simultaneous repression and release before raucous viewers, with a torch in the foreground taking up one third of the screen while shadows flicker aggressively on the blank walls. Having befriended Cortez in an earlier film, Laughton worked closely with the cinematographer to achieve an atmosphere of terror mingled with enchantment. In the remarkable scene where a strange peace falls over Willa as she, finally wised up to Powell¡¯s scheme, lays in bed and waits for his razor, the bedroom is lit into hard geometric shapes reminiscent of one of Fritz Lang¡¯s Dr. Mabuse thrillers. The otherworldly image that follows, with her lifeless body bound to a car at the bottom of the river while her blonde tresses sway like seaweed, has the ethereal quality of a Jean Vigo reverie. It is D. W. Griffith, however, who was Laughton¡¯s admitted major influence. The silent pioneer¡¯s distinctive grammar¡ªbits of which turn up in the film, like the iris shot that encircles the faces of John and Pearl as their murderous stepfather strides toward the house¡ªfascinated Laughton, as did Griffith¡¯s predator-and-prey worldview. On the run from Powell, the kids drift down the Mississippi on a small boat while Nature watches from the sidelines. A spider web is superimposed over their tiny vessel, Pearl sings a song about a ¡°pretty fly¡± in a voice not quite hers, toads and foxes and turtles appear in enormous close-ups. The deliberate naivet¨¦ of these passages pushes beyond the film¡¯s Biblical intimations and into something more primeval, elemental survival as an excursion dreamed up by children. Farmhouses along the way look like storybook cutouts, the villain turns up as a tiny shape on the horizon. (To achieve this forced perspective, a little person was filmed atop a pony.) ¡°It¡¯s a hard word for little things,¡± an old woman sighs after seeing a rabbit swooped up by an owl, and it¡¯s no accident that she¡¯s portrayed by Griffith¡¯s muse herself, Lillian Gish. Gish¡¯s Rachel Cooper, a feisty mother hen who takes John and Pearl into her home of stray youngsters, describes herself as ¡°a strong tree with branches for many birds.¡± A beacon of light in the grim (or, rather, Grimm) topography, she¡¯s also irritable, prone to talking to herself, and not afraid to confront the satanic column of muscle standing at her doorstep. Granny here totes a shotgun¡ªplenty of steel in that pint-sized frame. More than a direct link to early melodrama, Gish¡¯s presence occasions a collision of acting styles. In their scenes together, the actress¡¯ plainspoken conviction chafes absorbingly against Mitchum¡¯s amused insolence, her unshakable belief in the sturdiness of Miss Cooper contrasted with his understanding of Powell as an archetypal ogre with signs literally tattooed on his massive knuckles. Their celebrated duet, with both singing the hymn ¡°Leaning on the Everlasting Arms¡± on a darkened porch, is a spiritual tug of war that sets the stage for the physical confrontation that follows. Cortez¡¯s cinematography is at its most electric here, alternating between pools of luminosity and pits of murkiness, often keeping the two adversaries on opposite planes in gorgeous compositions perpetually on the verge of rupture. 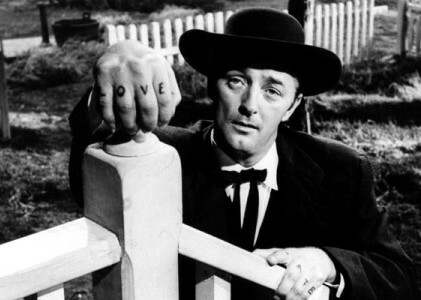 Now justly revered, The Night of the Hunter was a critical and commercial disappointment when first released. It is still so startling when seen today; how must have it played to moviegoers in the Eisenhower decade? Its theme the search for the divine in an utterly godless world, its style an uncanny m¨¦lange of the archaic and the modern, this masterpiece somehow combines a Brechtian artist¡¯s analytical eye with a child¡¯s matter-of-fact awareness of evil and hope. (¡°The most seductive one-shot in the history of movies,¡± Jacques Rivette once called it.) It¡¯s easy to bemoan the fact that Laughton never directed again, but better to rejoice in the visions that he did bring to life, aided by Cortez¡¯s volatile clashes of light and shadow. Fernando F. Croce is a San Francisco-based film writer whose work has been published in Film Comment, Reverse Shot, Slant, Mubi and Fandor.